The tutorial explains how to use Excel functions to convert text to date and number to date, and how to turn text strings into dates in a non-formula way. You will also learn how to quickly change a number to date format. Since Excel is not the only application you work with, sometimes you'll find yourself working with dates imported in an Excel worksheet from a .csv file or another external source. When that happens, chances are the dates will export as text entries. Even though they look like dates, Excel won't not recognize them as such. There are many ways to convert text to date in Excel and this tutorial aims to cover them all, so that you can choose a text-to-date conversion technique most suitable for your data format and your preference for a formula or non-formula way. 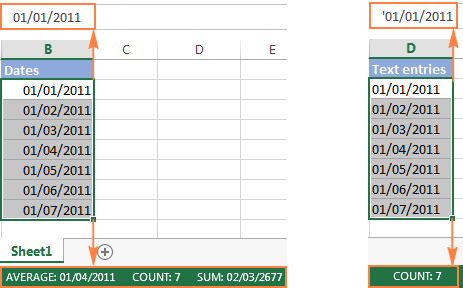 How to distinguish normal Excel dates from "text dates"
When importing data into Excel, there is often a problem with date formatting. The imported entries may look like normal Excel dates to you, but they don't behave like dates. Microsoft Excel treats such entries as text, meaning you cannot sort your table by date properly, nor can you use those "text dates" in formulas, PivotTables, charts or any other Excel tool that recognizes dates. There are a few signs that can help you determine whether a given entry is a date or a text value. Have Date format in the Number Format box on the Home tab > Number. If several dates are selected, the Status Bar shows Average, Count and SUM. General format displays in the Number Format box on the Home tab > Number. If several text dates are selected, the Status Bar only shows Count. There may be a leading apostrophe visible in the formula bar. Since all Excel functions that change text to date return a number as a result, let's have a closer look at converting numbers to dates first. As you probably know, Excel stores dates and times as serial numbers and it is only a cell's formatting that forces a number to be displayed as a date. For example, 1-Jan-1900 is stored as number 1, 2-Jan-1900 is stored as 2, and 1-Jan-2015 is stored as 42005. For more information on how Excel stores dates and times, please see Excel date format. When calculating dates in Excel, the result returned by different date functions is often a serial number representing a date. To convert such serial number to date in Excel, all you have to do is change the cell formatting. For this, select a cell or a range of cells with the numbers you want to convert to dates and press Ctrl+1 to open the Format Cells dialog. On the Number tab, choose Date, select the desired date format under Type and click OK.
Yep, it's that easy! If you want something more sophisticated than predefined Excel date formats, please see how to create a custom date format in Excel. 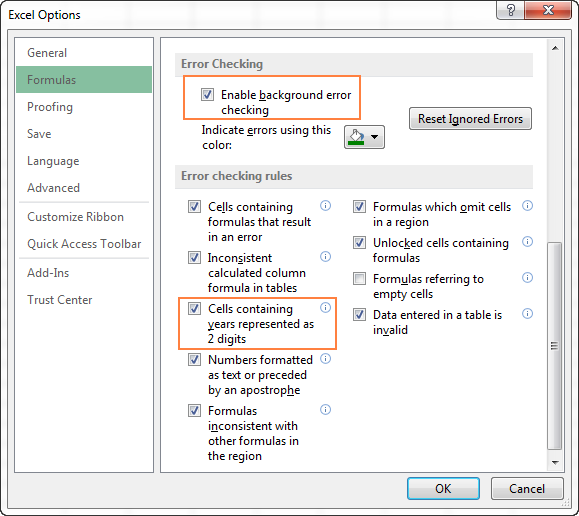 If some stubborn number refuses to change to a date, check out Excel date format not working - troubleshooting tips. It's a very common situation when a date is input as an 8-digit number like 10032016, and you need to convert it into a date value that Excel can recognize (10/03/2016). In this case, simply changing the cell format to Date won't work - you will get ########## as the result. Anyway, I will try to explain the general approach to converting such numbers to dates and provide a few formula examples. So, what you need to do is extract a year, month and date from the original number and supply them as the corresponding arguments to the Date function. For example, let's see how you can convert number 10032016 (stored in cell A1) to date 3/10/2016. Extract the year. It's the last 4 digits, so we use the RIGHT function to pick the last 4 characters: RIGHT(A1, 4). Extract the month. It's the 3rd and 4th digits, so we employ the MID function to get them MID(A1, 3, 2). Where 3 (second argument) is the start number, and 2 (third argument) is the number of characters to extract. Extract the day. It's the first 2 digits, so we have the LEFT function to return the first 2 characters: LEFT(A2,2). Note. The formulas demonstrated in this example work correctly as long as all numbers you want to convert to dates follow the same pattern. When you spot text dates in your Excel file, most likely you would want to convert those text strings to normal Excel dates so that you can refer to them in your formulas to perform various calculations. And as is often the case in Excel, there are a few ways to tackle the task. 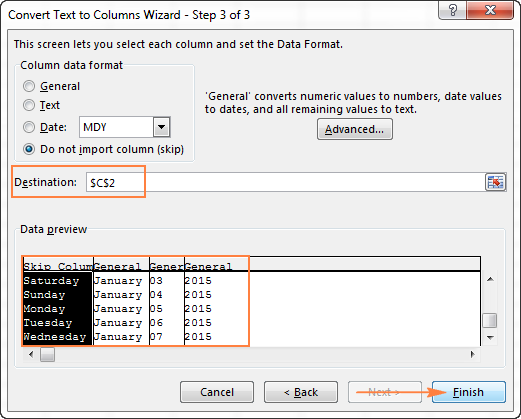 The DATEVALUE function in Excel converts a date in the text format to a serial number that Excel recognizes as a date. So, the formula to convert a text value to date is as simple as =DATEVALUE(A1), where A1 is a cell with a date stored as a text string. Because the Excel DATEVALUE function converts a text date to a serial number, you will have to make that number look like a date by applying the Date format to it, as we discussed a moment ago. Time information in text strings is ignored, as you can see in rows 6 and 8 above. To convert text values containing both dates and times, use the VALUE function. If the year is omitted in a text date, Excel's DATEVALUE will pick the current year from your computer's system clock, as demonstrated in row 4 above. Since Microsoft Excel stores dates since January 1, 1900 , the use of the Excel DATEVALUE function on earlier dates will result in the #VALUE! error. 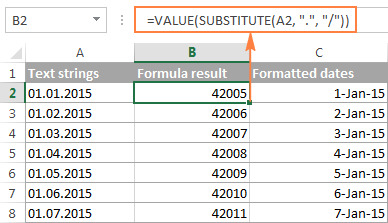 The DATEVALUE function cannot convert a numeric value to date, nor can it process a text string that looks like a number, for that you will need to use the Excel VALUE function, and this is exactly what we are going to discuss next. Compared to DATEVALUE, the Excel VALUE function is more versatile. It can convert any text string that looks like a date or number into a number, which you can easily change to a date format of your choosing. Where text is a text string or reference to a cell containing the text you want to convert to number. Apart from using specific Excel functions such as VALUE and DATEVALUE, you can perform a simple mathematical operation to force Excel to do a text-to-date conversion for you. The required condition is that an operation should not change the date's value (serial number). Sounds a bit tricky? The following examples will make things easy! As you can see in the above screenshot, mathematical operations can convert dates (rows 2 and 4), times (row 6) as well as numbers formatted as text (row 8). Sometimes the result is even displayed as a date automatically, and you don't have to bother about changing the cell format. If your text dates contain some delimiter other than a forward slash (/) or dash (-), Excel functions won't be able to recognize them as dates and return the #VALUE! error. Select all the text strings you want to convert to dates. Press Ctrl+H to open the Find and Replace dialog box. Now, the DATEVALUE or VALUE function should have no problem with converting the text strings to dates. In the same manner, you can fix dates containing any other delimiter, e.g. a space or a backward slash. 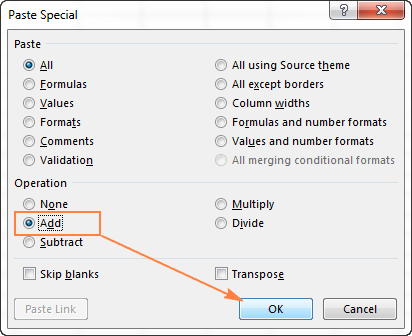 If you prefer a formula solution, you can use Excel's SUBSTITUTE function instead of Replace All to switch your delimiters to slashes. Where A1 is a text date and "." is the delimiter your strings are separated with. And have the text strings converted to dates, all with a single formula. As you see, the Excel DATEVALUE and VALUE functions are quite powerful, but both have their limits. For example, if you are trying to convert complex text strings like Thursday, January 01, 2015, neither function could help. Luckily, there is a non-formula solution that can handle this task and the next section explains the detailed steps. If you are a non-formula user type, a long-standing Excel feature called Text To Columns will come in handy. It can cope with simple text dates demonstrated in Example 1 as well as multi-part text strings shown in Example 2. You don't really need formulas, nor exporting or importing anything. All it takes is 5 quick steps. In this example, we will be converting text strings like 01 01 2015 (day, month and year are separated with spaces) to dates. In your Excel worksheet, select a column of text entries you want to convert to dates. Switch to the Data tab, Data Tools group, and click Text to Columns. 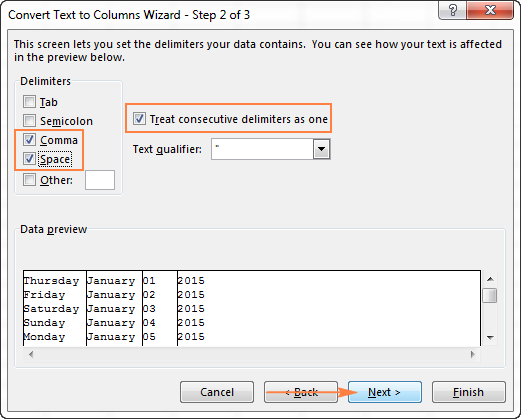 In step 1 of the Convert Text to Columns Wizard, select Delimited and click Next. In step 2 of the wizard, uncheck all delimiter boxes and click Next. In the final step, select Date under Column data format, choose the format corresponding to your dates, and click Finish. In this example, we are converting the text dates formatted as "01 02 2015" (month day year), so we select MDY from the drop down box. Now, Excel recognizes your text strings as dates, automatically converts them to your default date format and displays right-aligned in the cells. You can change the date format in the usual way via the Format Cells dialog. Note. For the Text to Column wizard to work correctly, all of your text strings should be formatted identically. For example, if some of your entries are formatted like day/month/year format while others are month/day/year, you would get incorrect results. 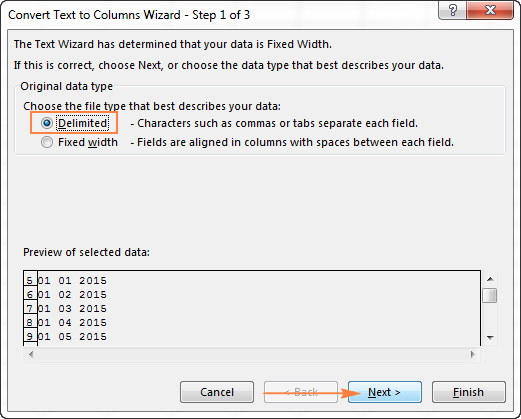 You will have to put a bit more effort and use both the Text to Columns wizard and Excel DATE function. Select all text strings to be converted to dates. Click the Text to Columns button on the Data tab, Data Tools group. 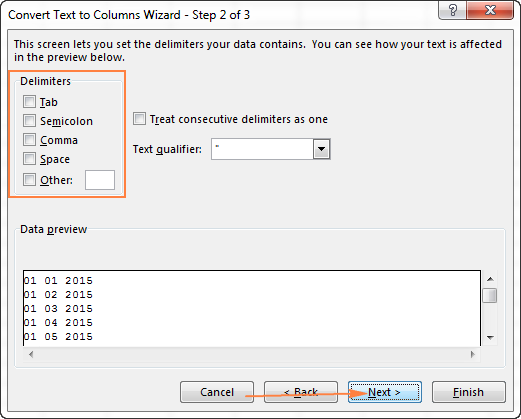 On step 1 of the Convert Text to Columns Wizard, select Delimited and click Next. On step 2 of the wizard, select the delimiters your text strings contain. For example, if you are converting strings separated by commas and spaces, like "Thursday, January 01, 2015", you should choose both delimiters - Comma and Space. It also makes sense to select the "Treat consecutive delimiters as one" option to ignore extra spaces, if your data has any. And finally, have a look at the Data preview window and verify if the text strings are split to columns correctly, then click Next. 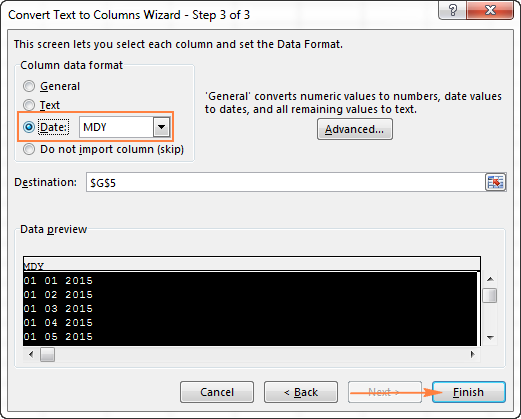 On step 3 of the wizard, make sure all columns in the Data Preview section have the General format. If they don't, click on a column and select General under the Column data format options. Note. Do not choose the Date format for any column because each column contains only one component, so Excel won't be able to understand this is a date. If you don't need some column, click on it and select Do not import column (skip). If you don't want to overwrite the original data, specify where the columns should be inserted - enter the address for the top left cell in the Destination field. When done, click the Finish button. As you see in the screenshot above, we are skipping the first column with the days of the week, splitting the other data into 3 columns (in the General format) and inserting these columns beginning from cell C2. The following screenshot shows the result, with the original data in column A and the split data in columns C, D and E.
In our case, year is in column E and day is in column D, no problem with these. Where C2 contains the name of the month, January in our case. "1&" is added to concatenate a date (1 January) so that the MONTH function can convert it to the corresponding month number. To quickly convert a range of simple text strings to dates, you can use the following trick. Copy any empty cell (select it and press Ctrl + C). Select the range with text values you want to convert to dates. Click OK to complete the conversion and close the dialog. What you have just done is tell Excel to add a zero (empty cell) to your text dates. To be able to do this, Excel converts a text string to a number, and since adding a zero does not change the value, you get exactly what you wanted - the date's serial number. 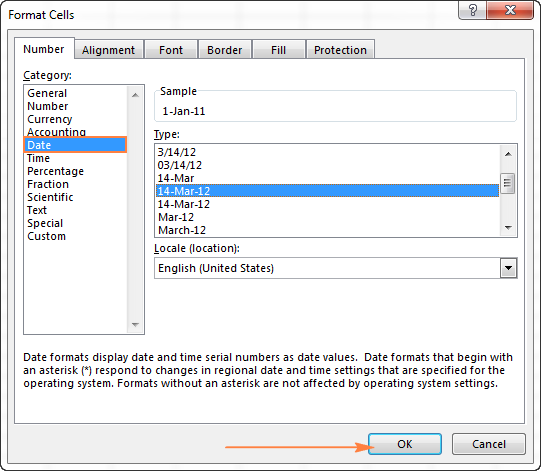 As usual, you change a number to the date format by using the Format Cells dialog. Clicking the exclamation mark will display a few options relevant to your data. In case of a 2-digit year, Excel will ask if you want to convert it to 19XX or 20XX. If you have multiple entries of this type, you can fix them all in one fell swoop - select all the cells with errors, then click on the exclamation mark and select the appropriate option. Cells containing years represented as 2 digits under Error checking rules. 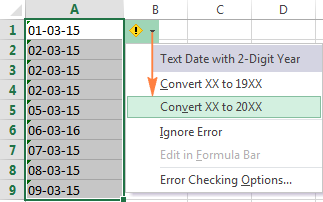 This is how you convert text to date in Excel and change dates to text. Hopefully, you have been able to find a technique to your liking. In the next article, we will tackle the opposite task and explore different ways of converting Excel dates to text strings. I thank you for reading and hope to see you next week. 238 Responses to "How to convert text to date and number to date in Excel"
I have a column with 'Apr 7, 2016 10:39 AM' type data in it. How do I convert this text into a date/time format so I can use it to do further calculations? I.e Find the difference in time elapsed between 'Apr 7, 2016 10:39 AM and Apr 14, 2016 09:21 AM'? I've tried text to column (which I don' want to do in order to protect the data source). Is there a formula for this? activate the cell with a text you want to transform, then under the Home tab find Number format box, and choose Long Date or Short Date to your liking. If it already says Date – your data is ready for calculations. also does not work with the leading zero. any thoughts? could you send us your sample workbook with the data and the result you expect to get to support@ablebits.com? It's a bit difficult to help you right now, since we need to take a look at the way your data is formatted and arranged. I am using Google sheet. I have a column in which the date is entered as text "Apr 21,2017 - Apr 25,2017". Now, I need your help to convert this to 04/21/2017 - 04/25/2017. Please help me, if possible. Thanks for the help, great job! Please help me, If I have in a cell this: 2015-06, and I need to have Jun-2015, How should I do? i am trying to convert excel date format from 5/29/2017 to 2017-05-29 but not working. can anyone give me a hand? How do I convert them to real dates & times? could you please specify what are these values stand for? It's just the very last date in Excel (December 31, 9999) is stored under the 2958465 number. The stamps you provided simply can't represent the integers of the dates for Excel. So, for us to help you better, please specify what these values should transform into exactly. How to convert below date format into "DD/MM/YYYY HH24:MI:SS"
How to convert complete no of entries in ss from 2017-07-03 12:47:47 IST to 2017-07-03 12:47:47, i need to remove text(IST) in all the date entries. if I understand your task correctly, you will need to use DATE function. You will find the instructions on how to work with the function on this blog post. If you need an instant solution, you can try our Date & Time Wizard from our collection of add-ins for Excel - Ultimate Suite. You can download its trial version from this web page. Very good solution. Converted the below format date into standard format by following the above steps. Thanks alot. hey i want to convert date into next date..
as far as I can see, you just need to add one day. how do i convert: "september 10, 2017" and "march 12, 2016" to dd/mm/yyyy? I would like to sort below date format but it is not formatted as DATE. How do i change this to a DATE format so I can sort in chronological order? thank you in advance. You can call me Padman. I find your page is different than others in the net. I managed to learn a bit here. My problem is unique to me, haven't seen the solution here or in any other sites. I downloaded a bunch of data, one of them is date - "1/13/2017 8:10:00 AM" (left aligned in the cell), when I try to format that, I get "#VALUE!" error, when I use the formula "=DATEVALUE(TEXT(B__,"mm/dd/yyyy"))". For some data, like "1/12/2017 10:50:00 PM", it's converted to "12-Jan-2017". Need your help to resolve and get the dates converted. Sorry we can't assist you better. Hi, I'm trying to convert 11/9/2017 to a date but when I charge the format it comes up as #########. How do I convert it to a date? For me to understand the problem better, please send me a small sample workbook with your source data and the result you expect to get to support@ablebits.com. Please note that the formula above works only with dates prior to January 1, 1990. Hi, I have date in number 43012, how can I convert it to dd/mm/yyyy. Need an urgent help !!! How would i convert the same into "DD/MM/YYYY" or "YYYY/MM/DD"
Trying to convert 17-JAN-18 10.54.53.000000000 AM to 1/17/2018. Thanks. How would I be able to convert "WED-14-JAN-1976 00:00:00" into 14/01/1976? Please note that you can convert your text string into a date using the standard Excel Text to Columns feature and the DATE function. Please see Example 2 in this section of the article above. Where A1 is the cell that contains your text string. After that you can copy this formula down along the column. Hi, No, but what if I need to convert serial into a date which is not in a separate cell, but being a part of the text line, so the that Date format can't be applied to this cell. It sounds as if you will need to use the Text-to-Columns tool first, split out the serial value and then convert the resulting serial value using the Format Cells/Date process. Closer to my current issue is "half" dates. I have 1-Jan CSV file report on export from system. The 1-Jan cell value should have been 1-01( this was equipment ID #'s). My resolution was special paste and split data then manual correct. I would prefer a simple formula conversion is anyone can see one. I thought this would be simple but I can't find it anywhere. I have months listed in column A. I want to create a date that's the first of that month. Something like =date(2018,A5,1), where the A5 cell says, for instance, "April", so it becomes 4/1/18. Except that I can't get it to recognize the text in A5 as a month, even trying many tricks I've seen here and on other sites. Thanks in advance for your help! have the month column (A) format to custom "mmmm" to show the month only. but be sure the content data still complete 1/1/18 and so forth. In the other cell, input =TEXT(A1,"mm")&"/01/18"
Right click the cell then choose format cell then choose Date from the list and select the display format you want. How do I change the date format from dd/mm/yyyy (eg. 01/01/2018) to dd-mmm-yy (eg. 01-Jan-18)? None of the formatting tools in Excel are allowing me to change the format, and when I click on "Show Formulas", the dates (which have been prepopulated by an accounting programme and then converted into an Excel spreadsheet) are the same as they appear in the spreadsheet (eg. 01/01/2018) and they appear in the formula bar as '01/01/2018. Please help! I have checked they are text and not dates. AbleBits has done a great job of describing how to convert data that is exactly in the state your's is in. Rather than re-type all the steps I'll point you to it. Please see Example 2 in this section of the article above. You can easily change this text into a date by removing the "'" in front of the date. Excel will then recognize it as a date and you can then modify the display in Format Cells. If you need the ellipse in the date remove the "'" go to Format Cells and in the Custom Option in the field enter "@*." I think this will do it. Where the fractional date is in A11, enter this in an empty cell and format the cell in the format you need. b) 0216 (mmyy) into 29/2/2016? Note: the dd is always the last date of the month. Anyone help on how to convert a date from a conventional format like 12-03-2018 to look like 12032018? used this formula "=RIGHT(E8;5)" as select the last return of a month but it showed number like "40631" .How do i change to get "/mm/yyyy"? Have you checked the formatting for the cell that holds the 40631? The format should be the mm/yyyy and it looks as if it's General or Number. I changed the format in customs by mm/yyyy but no change takes place in result!? another question, somewhere I haired that when you change the 20110328 to 28/03/2011, you could do this changes with this format "yyyy/\mm/\dd". I do this work but it doesn't change.Do you know the correct form of last format??? Dates and Excel can be a real pain. I took your sample "20110328" put it into cell A22 and entered this formula in B22 and formatted it Custom dd/mm/yyyy. Let me know if it works for you. How can I conert a text date like “Thu 5 Jul 2017 11:59 AM” to date ? You might be able to right click the cell that holds the data and choose Format Cells then Date then the format you want. If you need to split that time away from the date, I would use the Text-to-Columns tool. Highlight the cell then under Data select the Text-to-Columns tool. In that window choose the Fixed Width button then OK. Next click on the lines you don't want to use to split the data then OK. Then highlight the column that holds the date select the Date dropdown and choose the DMY option then OK.
Now you can right click the cell with the date and choose Format Cells and choose the Date option and select the date format you want. Any help in trying to convert 01/01/2018 into January 1st 2018 please? I think this will get you where you want to go. How do I split the Month Day and Year without using Text to columns? or at least convert the date to just the day. Example 08/08/2018 to just 08 (day)? OUTPUT IS ###### IF I USE ANY OF THE ABOVE METHODS. wHERE AM I GOING WRONG? Great job on this thread! How do I convert Jan/31/18 08:42 PM to 01/31/2018 ? Hi I have Excel text column having value as 'Wed Feb 07 13:39:40 PST 2018' I want to convert to another column with date/time type with value as 2/7/2018 1:39:40 PM , how to do it? How to convert Thu 11:47 PM to date format. Thu 11:47 PM is the email received date. I don't know what formula I can use to formulate this as a normal date. My file is nearly 600K lines and there's no way I can manually change the date for them. Please help!! This is the BEST website I've ever visited for Excel help. What incredibly clear and worthwhile information. Thank you! Changed my world. dd/mm/yyyy are "dates". Does anyone have an idea on how to fix the "General" ones so that I can format them to dates? I really need help with this. I fix it manually but it is so time consuming because each month has over 100 transactions. Please note that the result will be stored as text. Thank you! The DateValue function was exactly what I needed. I'm not having any luck with VALUE or DATEVALUE. I have a column with dates that show as 1/18/2017 and say they're formatted as "general". I first tried just changing the formatting to "dates" but nothing changed, they still are basically text. I then tried using DATEVALUE and VALUE in a new column but it just returns #VALUE! I'm at my wit's end. If they had even written them YYYY/MM/DD I could at least have sorted them as text. Please try applying the Text format to cells before entering the values. Thus, your initial records JAN1, JUN5, or MAR9 will be kept as they are. Otherwise, Excel will treat them as dates and convert right away accordingly. And I'm afraid the only way to get them back is to apply the Text format and enter the correct records manually. HOW TO CONVERT DATE 01/05/2019 INTO MMM-YY FORMAT (MAY-19). I am highly experienced, advanced and skilled. This is a fine, intelligent article, and written in a comprehensible level for novices while not so dumbed down that it is not an efficient resource for gurus. Extremely well done. Frankly, I never grasped the benefit of the seemingly silly or inert VALUE(), though I had stumbled onto the (equivalent?) utility of =A1+0 very early on. I've been doing A1+0 for decades; I man now replace that convention with VALUE() as a matter of style. Using A1+0 is sort of saying "This is a stupidly designed product, but I'm even stupider, that I am resorting to something as ludicrous as this." Frankly, I never grasped the benefit of the seemingly silly or inert VALUE(), though I had stumbled onto the (equivalent?) utility of =A1+0 very early on. I've been doing A1+0 for decades; I may now replace that convention with VALUE() as a matter of style. Using A1+0 is sort of saying "This is a stupidly designed product, but I'm even stupider, that I am resorting to something as ludicrous as this." Awesome Article. Thank You so much.